Edward Mallory justified his attempt to climb Mt. Everest by saying "because it's there." So why do I ride my bicycle when our culture makes it so easy to drive a car? Health, sure. Ecologically sound, absolutely. I want to add one more reason: because I can. Every bike ride is a celebration of my health, of my continuing ability to be physically active. I can't say "because it's there" because, hey, I'm just riding to the store for groceries. However, how many years did I spend pursuing my career, spending my days inside a building? Commuting by bicycle, as far as I'm concerned, is practical recreation, utilitarian vacationing. Commuting during winter weather is one way to enjoy shorter rides, one that can come with its share of adventure. I've found that stretching my bicycling capabilities is quite a bit of fun. It's a no-brainer to head to town on the bike when it's shirt-sleeve weather and I'm returning a book to the library. The bicycle can pack much more, though, and in quite diverse weather. Challenging the limits of commuting is the spice to the everyday soup of to-town-and-back. One day of commuting, I bought a trash can at the local farm store and then delivered it to my son's house. Then I loaded a big bag of leaves to take home for compost. 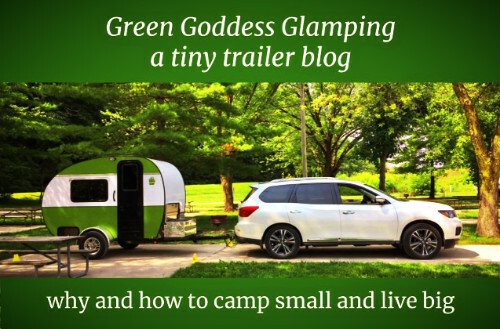 Would this have been easier using my SUV? Yes, but not more fun! I got the job done and had some enjoyable riding. In fact, I felt a little bit like a parade, cruising down the road with my unusual bike cargo. I regularly ride to meetings at my town's private university. I decided to ride in the snow, and that provided a chance to stretch my experience and to test my new bike's capabilities. It was a great ride. 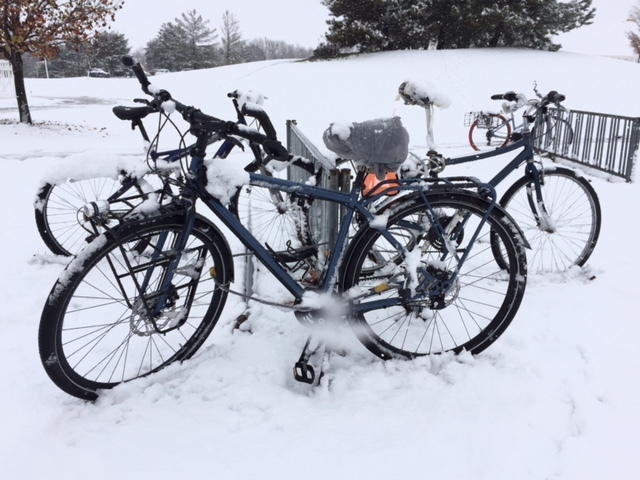 I've ridden in the snow before, but this was the first time this year--and a wonderful chance to really enjoy the first snow of the season. This was the largest load of groceries I've ever transported by bicycle. I could have taken a little more, but the folks at the grocery store were certainly surprised. They loaded up the two canvas bags and then said, "What do ya want us to do with the rest?" pointing to the still-filled counter. I pointed to the bike trailer, which the cashier hadn't somehow figured to be a bike trailer. The store clerk helped me out to my "vehicle," carrying the two canvas bags while I rolled out the Burley Travoy trailer. 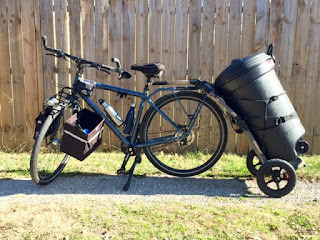 The added weight really settled down the bike and trailer, even with the ride home including a half mile of rails-to-trails route and even a bit of single track, graveled path. The cashier told me that the store could provide car delivery of the groceries, but I said, "No, thanks, I've got it okay"--a satisfying moment. OK, 14 degrees and a stiff north wind provided me with the opportunity to test my cold weather gear. I actually over-dressed and got a little hot on my one-mile ride (one way). Coming home, I packed some of the clothes in my bag and felt more comfortable. It's amazing how having the right bike and clothing can make the commuting experience so much fun. I think I'm ready for the single-digit weather coming next week. It's also interesting how a bit of all-weather commuting accustoms one to getting out in the wind and rain and snow--or a combination of all three! It's a bit of a stretch sometimes, but I've really cut down my car driving and increased my bicycle enjoyment with just a bit of a commitment to ride in more extreme weather. It may take a little longer to commute by bike instead of car, although the trip to our local university can be actually shorter because of a rails-to-trails shortcut and because I can ride right up to buildings rather than parking in the parking lot and then walking in. I think how long it takes to dress for winter commuting is the biggest difference in commuting by bike. Once dressed, I'm no colder while commuting and take not much longer to get anywhere. The experience is certainly more memorable--and no scraping ice off the windshield. Commuting becomes an enjoyable part of the day, not just a few minutes written off and forgotten. I like that. I like getting outdoors and enjoying the day, even if the weather isn't especially comfortable. One day I won't be able to do this, but today is not that day.